Dale M. Carter, M.D., has joined the Department of Neurology as a headache specialist. Jan. 29, 2018 | LITTLE ROCK — Dale M. Carter, M.D., has joined the University of Arkansas for Medical Sciences (UAMS) as a neurologist specializing in headaches. She sees patients in the Jackson T. Stephens Spine & Neurosciences Institute’s Neurology Clinic. 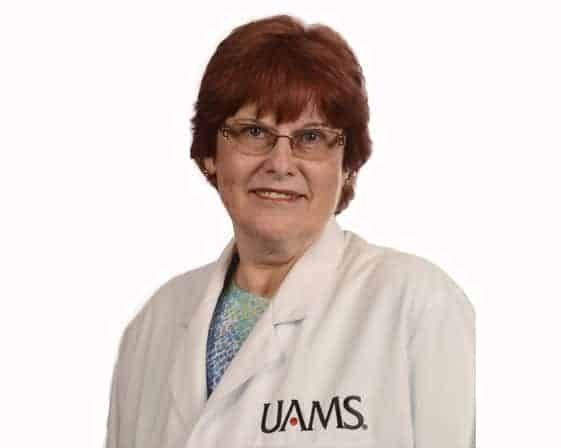 She also serves an educational role as an assistant professor in the UAMS College of Medicine’s Department of Neurology. “Headaches affect many people and can have a serious impact on quality of life. Dr. Carter brings many years of experience working with a wide variety of patients. We are happy to offer her expertise to the public through our Neurology Clinic, and she will be a valuable teacher for our neurology residents,” said Robert L. “Lee” Archer, M.D., professor and chairman of the Department of Neurology. Carter earned an M.A. in counseling psychology in 1976 at Ball State University in Muncie, Indiana. She obtained her medical degree in 1984 from Albany Medical College in Albany, New York, where she received the Frederick Hesser Award for Academic Excellence in Neurology. She completed her Neurology Residency at Albany Medical Center. Carter is board certified and holds memberships in the American Academy of Neurology and American Medical Association. Before joining the neurology team at UAMS, Carter lived in Portland, Oregon, where she had a private practice specializing in headaches.